​Candor Girls Basketball - Senior Shaylin Heidl was named as an Honorable Mention for the Class D All -State team. Shaylin finished her senior season averaging 20 points and 9 rebounds a game, which included fourteen 20 point games and nine Double-Doubles. Congratulations Shaylin! The third I.A.C. all-star to sign the NJCAA Letter of Intent to join the Panthers women's soccer program is Candor standout Angela Martone, Class of 2016. A four-year starter for the Indians, Martone spent most of her high school career as a center midfielder, amassing 24 goals and 16 assists. "Angela is a very crafty player and a great teammate," said Tompkins Cortland Head Coach Bob Rice. "I don't think she realizes how much potential she has. I feel very fortunate to be getting a player and person like Angela. I think we are a great fit for her and I can't wait until the 2016 season." A two-time first-team all-I.A.C. 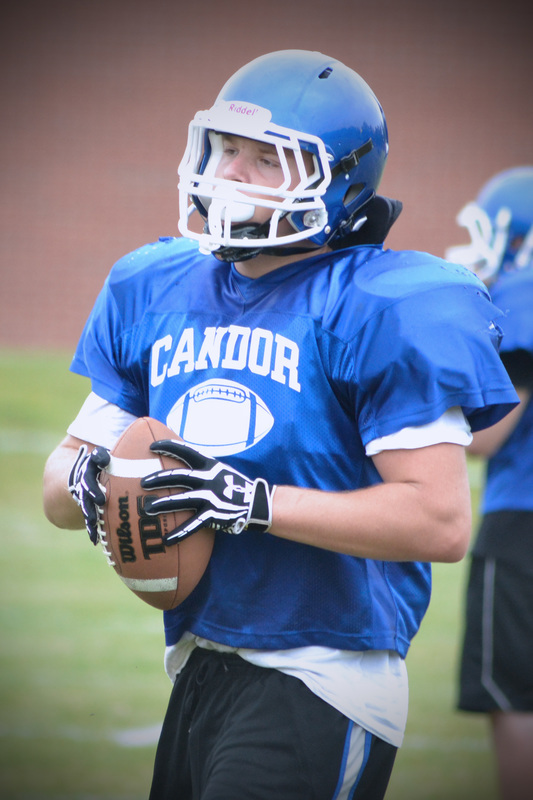 selection, Martone also played basketball and softball at Candor. In addition, she participated in the school musicals and both all-county and NYSSMA Chorus. "She brings such positive experiences to our program, from being a three-sport athlete, a good student in the classroom, and just a well-rounded individual," said Rice. "She is exactly what I look for in a recruit." Candor High's Emily Potter, Class of 2016 has signed her NJCAA National Letter of Intent to play soccer at Tompkins Cortland Community College. She will join a defensive unit that was a big reason the Panthers finished 2015 ranked in the top 15 in the nation. "We are thrilled to welcome Emily," said Tompkins Cortland Head Coach Bob Rice. "Emily is an anchor. She was the strength and stability in the back for a very good Candor team, and I fully expect her to step into the same role here." Potter was a four-year varsity starter for the Indians, being named an I.A.C. All Star twice. She also was the I.A.C. Small School M.V.P. while helping the Indians to a conference title; just the kind of leadership that has Coach Rice excited. "Emily is a well rounded athlete and a great teammate," said Rice. "But probably my favorite thing about her is that her expectations for me are just as high as my expectations for her. She wants to be the best she can, and that attitude will help us get better as a program." Candor's Rachel Barnhart, Class of 2015, will be a TC3 Panther. The I.A.C. All-Star signed her NJCAA National Letter of Intent to join Coach Dave Stevenson's women's basketball program in 2015-16. "Rachel won't be out-worked on the court, and that's something we place a tremendous value on," said Stevenson. "She is a talented player that just hustles. I think she will fit in very nicely with the team we're looking to put on the floor. I look forwarding to coaching Rachel. " Chelsy Kern Class of 2012 played soccer for Tompkins Cortland Comm. College Fall 2014. 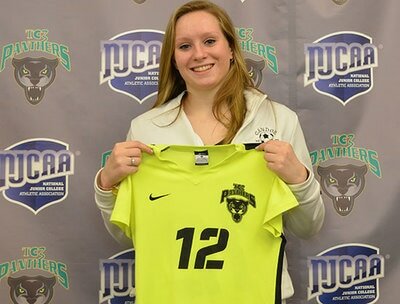 Rebecca Smith, Class of 2011, played softball and soccer for Corning Community College. Kellsie Giordano has been named to the Competitive Cheer Squad at Gannon University in Erie, PA. Congrats to Kellsie! Congratulations to two of our 2013 grads - Audrey Shaver and Madison Hornick for earning spots on the St. John Fisher University Volleyball Team . April 14, 2018: The Tc3 golf team earned a second place finish in the Mid-State Athletic Conference championship: William Stouffer finished with a score of 110. April 13, 2018: William Stouffer(Candor/Candor H.S.) rounded out the team scoring with a 101 as TC3 Panthers carded a team score of 370 to finish fifth among the nine teams at the Nicholas J. DeSocio Memorial Invite. Caitlin Kafka a 2008 graduate of Candor and 3 time sectional champion (2005, 2006, 2007) played at Broome Community College on the womens' team that won the 2008 National Championship. Tera Coates a 2008 graduate of Candor and 3 time sectional champion ((2005, 2006, 2007) is played at Clinton Community College on the womens Soccer Team & she was named to the 2008 MVC All-Conference Team. April 2017: Christian finished 29th overall in the field of 30,074 at the 2017 Boston Marathon with a time of 2:23:51. Christian Thompson (Class of 2007) displays his marathon race runner medals & ID tags.